Located in Northeastern Utah, East Canyon State Park (www.stateparks.utah.gov/parks/east-canyon) is the perfect place to take a quiet break, and enjoy a scenic overnight stay in an accessible lakeside yurt. Perched on the hillside, the yurt village overlooks the reservoir, and offers visitors a scenic and serene place to spend the night. Accessible parking is located next to the Wells yurt, with ramp access up to the spacious deck. The wide front door features level access, and there’s plenty of room to navigate a wheelchair inside the yurt Furnishings include two Adirondack chairs, a futon, a coffee table and a bunk bed with a double on the bottom (19 inches high) and a single on the top. There’s also an eight-inch high trundle bed under the bunk. 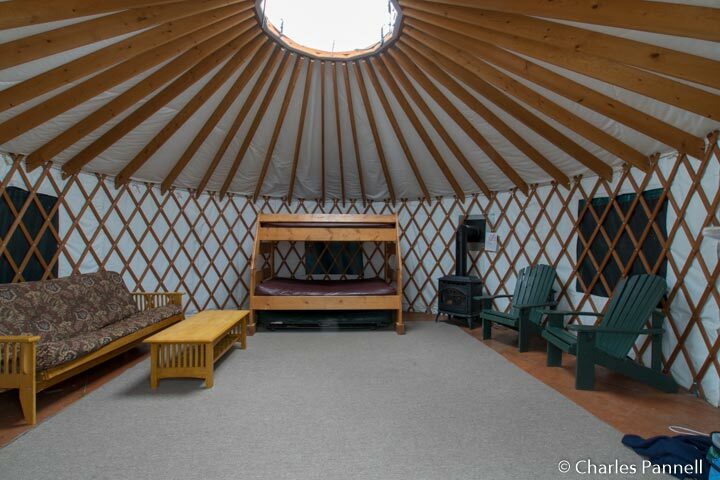 Round it out with electricity and propane heating and you have a very comfortable yurt. 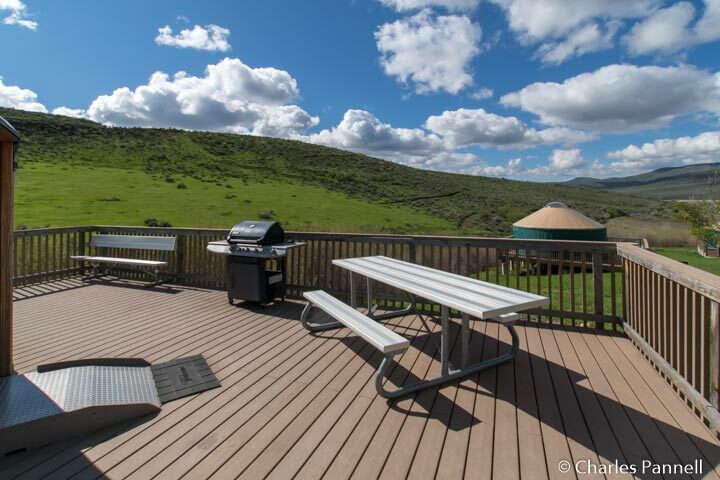 Outside, there’s plenty of room to wheel around the deck, which is furnished with a gas bbq, an accessible picnic table and two benches. And if you’d like to toast a few marshmallows, there’s also a fire ring in a level area near the deck. The accessible yurt is located next to the bathhouse, which is equipped with a private shower room that’s outfitted with a roll-in shower with grab bars, a hand-held showerhead and a fold-down shower bench. A family restroom is located next door, and it features a full five-foot turning radius, toilet grab bars on the back and left walls (as seated), and a roll-under sink. A mirror image family restroom, with toilet grab bars on the back and right walls (as seated), is located on the other side of the accessible shower room. All in all, it’s an extremely accessible setup. 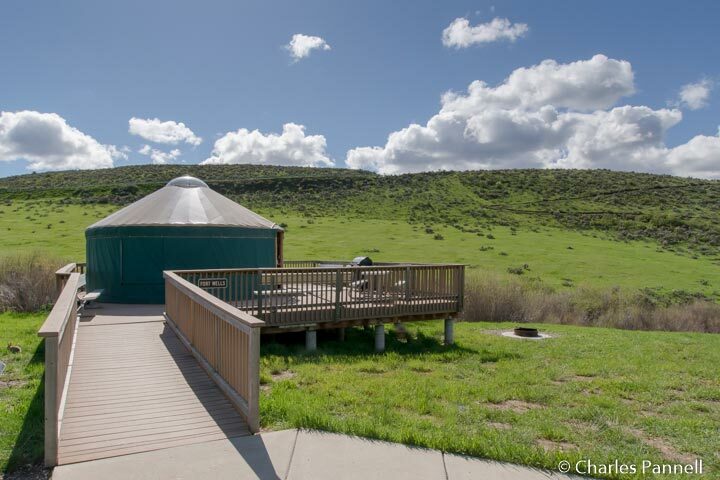 Even better, the yurt rents for a very affordable $60 per night. Just bring your bedding, towels, cooking gear and food and you’re good to go. And since there are just four yurts in the village, it’s also a peaceful spot to spend the night.